Irving Farm Coffee Roasters and Pop Karma opened new locations in Fulton Center last Friday, the first shops to do so since the Center opened on Nov. 10, 2014. With the opening of the two new shops, Fulton Center has taken a big step on the way to becoming a commercial center in addition to a transit hub. For roughly 14 months between the opening of the Center and the opening of these first shops, people often came into the Center—especially on cold winter days—to sit down on the windowsills and admire the architecture from inside, but there was little to do besides look around, unless you had a train to catch. Now, visitors can go to Pop Karma, a specialty popcorn shop where customers can enjoy flavors like Mediterranean, Zen Cheddar and Bacon Apple Bourbon Caramel. Pop Karma opened its initial location at 95 Orchard St. in the summer of 2012, and the shop at Fulton Center is its second location. Also open for business is Irving Farm Coffee Roasters, a purveyor of artisan coffee whose initial location opened at Irving Pl. in 1996. The Fulton Center location is Irving Farm's fifth in the city. The company also operates a shop and roastery in Millerton, N.Y., and offers coffee-making classes at its location in Chelsea, referred to as the Loft. To celebrate their grand openings, Pop Karma and Irving Farm offered special deals on Friday. The first 50 customers to make a purchase at Pop Karma received free bags of popcorn, and Irving Farm gave away small cups of brewed coffee, free of charge. So far, the opening of the two new stores has not driven a significant amount of additional foot-traffic through the Center. Louis Cubillos, a computer tech who works on Maiden La. and comes to Fulton Center twice per week, said that he has not yet been to the new shops, and that there were always a fair number of people sitting around at the Center, shops or no shops. “Every time I come here I see a lot of people sitting here,” Cubillos said. Nancy Elkes, who works in the Financial District two days per week and is also a Fulton Center frequenter, agreed, observing that the opening of the shops did not seem to generate a sizable increase in the number of visitors. “There's always a lot of people sitting on the ledges,” she said. Elkes, however, did think that the opening of Shake Shack would bring a lot more customers into the Center. The new Shake Shack is set to open later this year on the upper level of Fulton Center and will be the restaurant's 18th location in New York City. The addition of a Shake Shack just a few blocks from The King's College's campus is bound to be welcomed by King's students, who currently have to walk 15-20 minutes from campus to get to the nearest one in Battery Park City. On cold winter nights, the journey can be especially harrowing. "One time it was like 25 degrees—very windy, especially by the World Trade Center," Fermin Villalpando ('17) said of a recent walk to the Battery Park City Shake Shack. "I'm so excited for the Fulton Center Shake Shack to open, because then I won't have to walk all the way to Battery Park City." 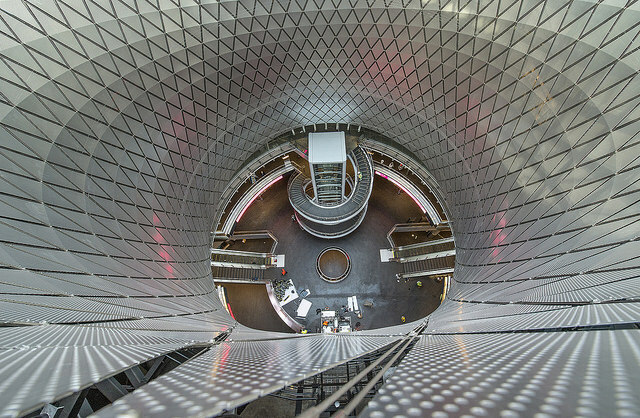 Fulton Center, according to its website, is meant to be “a modern hub of retail, culinary and media experiences in the historic Financial District.” By adding new shops, Westfield Corporation, the master lessee of the Center, hopes to make Fulton Center into a fixture of Downtown life, with something to offer tourists, commuters and residents alike.